"Sometimes you get too close"
The Bang Bang Club is a movie about photographers. The story focuses on four young combat photographers who are bonded by their livelihood and their desire to capture the truth throughout their careers. They use their vocation to risk their lives to tell the world of the violence and discord of the first free elections in the post-Apartheid world of South Africa. They do at great personal risk to themselves. They could have stayed at home and photographed more tranquil scenes but they chose to photography the violence and discord that made up post-Apartheid South Africa. In the world of a young Bill Clinton and of Nelson Mandela, this work strikes gold in its treatment of the racial tensions that all minorities have faced at one time in their life or another. 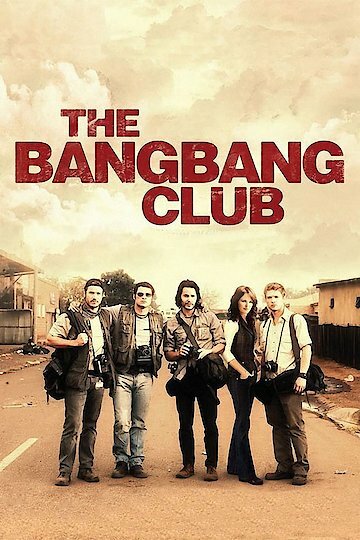 The Bang Bang Club is currently available to watch and stream, download, buy on demand at Amazon Prime, Amazon, Vudu, Google Play, iTunes, YouTube VOD online.